The only war that matters is the war against the imagination. The war is the war for the human imagination. I want to speak of a wild place. I want to tell you what it means to love a place that is threatened. I want to tell you of small actions that can change things. I consider that I know the forest fairly well, fairly intimately, not as a botanist or expert in any field of forest lore, but as a man who likes to meet the forest as a conversation between feet and fingers and senses, between leaf and trunk and the herb-rich forest floor. Who would plant his toes in the deep mulch and moss of our forest, like roots in the rich soil. Four years ago, I put up my hand to lead visitors on walks through the Strathbogie State Forest. Impacted by logging, the communities that surround the forest have come together to work out how to protect it. 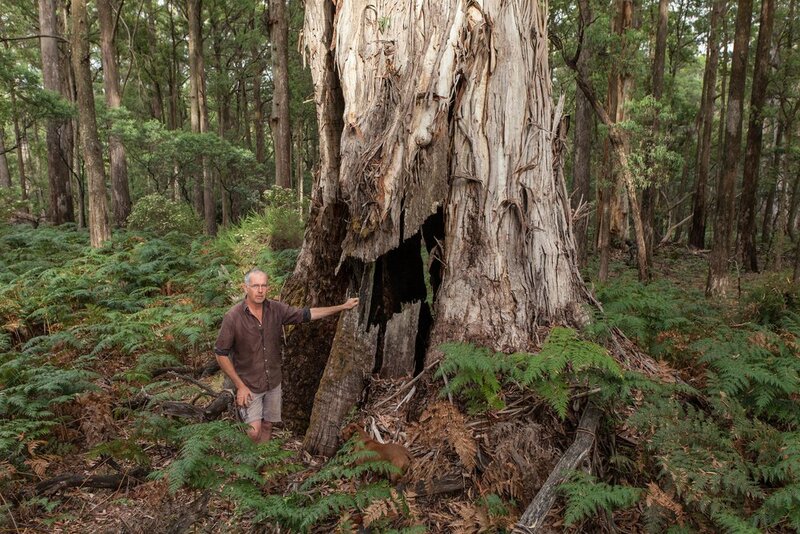 Guided forest walks are one way that the Strathbogie Sustainable Forest Group is currently highlighting the significance of the forest and why more Victorians should help to conserve it. There are very few folks these days who walk in the forest, who choose to spend time out there, in a swag under the stars and the watching gums, exploring the origins of a creek, following that ridge line to the unnamed peak. As I see it, there is the chance that those who come and explore the forest might fall in love with it. Those Sunday afternoons have been a time of great revelation. Hundreds of people have joined together to walk on place. We have explored together this beautiful and overlooked corner of the world, we have walked with the old timber getters, with botanists and storytellers, with those who know where gold was mined. We have spotlighted the highest density of Greater Gliders in Australia. Explored for mushrooms and fungi, bushfood and medicine plants, visited the places where the old Mountain Grey Gums and Peppermints are twisted and aged far beyond the first days of white settlement. We have felt the brush of the wings of the Powerful Owl as dusk falls and the tips of the trees on the high mountain turn vivid pink. Many have joined us for these explorations, coming from all walks of life to this forest. To this unpeopled place, save for a few pig hunters and motorcyclists. Why so few people now? These days, when the nature documentaries are shown in vivid, widescreen technicolour, it seems that we are still interested in the world around us. But it no longer fulfils the need it once did. Once there was a time when more of us knew the language of wild places, when we could hear the songs of the wind, the language of birds, when we could follow the braille of tiny marsupials wending their paths, when our vision was wider, when we were immersed within the great conversation of the wild. The country was once our imagination; our minds did not halt at the skin upon our foreheads - we were part and parcel of it, we were not separate. In the early 21st Century, we seem to have outsourced our imaginations to television, social media, and handheld technology. With this outsourcing, I wonder if we need the forest anymore, whether the lack of respect with which we treat this otherness that we encounter, the damage that we are visiting upon this planet, are simply symptoms of our collective loss of imagination. We must remember, too, that losing habitat and species is like losing a language. In the week when the last male Northern White Rhino died in Kenya, I asked myself, ‘What is it I can do?’ If we are not careful, it will be the last Greater Glider or the last Powerful Owl, or any of a vast number of smaller birds, mammals and insects. In answer, we must turn to our wilder places and once again engage in a conversation with all that we still have. Simeon Ayres is a farmer and small business person from Strathbogie who holds a deep affinity for the country he lives in. Banner image courtesy of Michael Flett.